Tiny Acorns provide energetic, educational & fun sessions for all pre-school children, from birth to five years. There are a variety of classes available, each tailored to the unique stage of your child’s life. You can choose to pay-as-you-go or pay upfront for a course of classes – it’s up to you. Click here to see more about our discount pricing. Click here to see more about our online booking system. Please note, some classes MUST be booked in advance. It’s always best to book your class to guarantee your place! For locations, prices, and more class information, click on the banner below. Baby Squirrels: From newborns to walkers. The most gentle of experiences. Feathers, bubbles, parachutes, songs, & of course lots of kisses & cuddles make Baby Squirrels the most wonderful time for non-walkers. 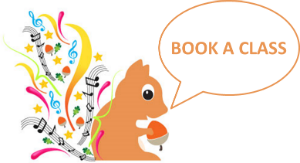 Musical Squirrels: A musical class for 0-4s, perfect for people wanting a group with mixed ages. Perfect for those with children of multiple ages, for babies who are fascinated by older children.